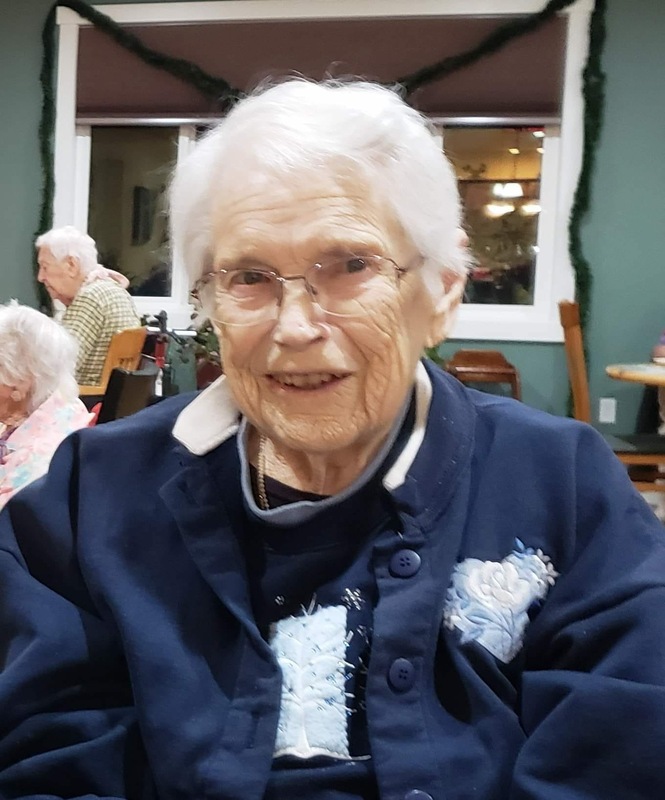 Inez Larson Hohn, age 94, passed away on February 2, 2019 at Silver Springs Assisted Living Facility in Townsend, Montana, where she had lived since October of 2017. Inez was delivered by a midwife during a snowstorm on May 10, 1924 on a farm near Troy, South Dakota to Gilbert and Lora Larson. As a child of the depression Inez learned to work hard on the family farm. After graduating from Waverly High School, she moved to Des Moines, Iowa to work for Postal Telegraph. There she met Vincent Hohn, a good-looking sailor from Montana. She transferred to Helena, Montana with Western Union and she and Vincent were married on January 22, 1946, in East Helena. They ranched near Clasoil for many years. Here they raised their 8 children. Even as a stay at home mom with 8 children, Inez found time and energy to be an active member and work her way through all the chairs in the Women of the Moose Lodge in Helena. She was active in the Clasoil Home Demonstration Club and served as a 4-H leader for many years. She also ran several home-based businesses: raising chickens and maintaining a weekly egg delivery route in East Helena-Helena, baking and decorating many wedding cakes, and running a ceramic shop, Hohn’s Hobbies, out of her basement. When all of her children reached school age, she went to work at Carroll College and then the State of Montana Auditor’s Office/Insurance Division. Inez loved traveling. She and Vince scoured the state looking for greenware and garage sales, followed their sons for sporting events, and attended many Navy reunions around the US. They went to Japan and Germany to visit their sons who were in the service. After Vince’s death Inez toured the Scandinavian countries and took cruises to Hawaii, Panama Canal, Mississippi River, and Alaska. After retiring from working for the state, Inez and Vince moved into East Helena where she set up a ceramic shop in the garage out back and transformed the yard with beautiful flowerbeds and a raspberry patch. After Vince’s death in 1993, Inez began volunteering at the Talking Book Library in Helena. She moved to Townsend in 2001 and became an active member of the community. She volunteered at the Broadwater Food Pantry and the Museum, served on the Tree Board, was President of the Senior Dinner Club, and was an active member of Townsend United Methodist Church and the Townsend Crimson Gals Red Hat group. Inez was not afraid of technology. She installed Windows 10 on her home computer by herself. She loved Facebook on her smartphone because it kept her in contact with her 8 children, 20 grandchildren, 27 great-grandchildren, and 5 great-great-grandchildren. She also loved playing Words with Friends and doing jigsaw puzzles on her computer. Inez is survived by 7 of her children: James (Pamla) of Montana City, Sheila (LaVerne Heavirland) of Townsend, Thomas of Columbus, MT, Beverly of Vancouver, WA, Mark (Penny) of Kent WA, Dave (Dee) of Tuttle, OK, and Brian (Claudette) of Townsend. She is also survived by her brother Gilbert Larson, Jr of Goodwin, SD, and her dear friend Clara Zabrocki at Silver Springs ALF. She was preceded in death by her parents, her sister Ruby Larson Gunther, her husband Vincent, her son Robert, and her grandson Eric Bieber. Inez’s viewing will be Friday, February 8th from 9 a.m. to 2 p.m. at Anderson Stevenson Wilke Funeral Home, 3750 N. Montana Avenue, Helena. Burial will be Friday, Feb 8th at 3 p.m. at the Montana State Veterans Cemetery at Fort Harrison. Funeral Services will be Saturday, Feb 9th at 2 p.m. at Townsend United Methodist Church, 200 N. Cedar, Townsend, MT. A reception will follow the service in the fellowship hall of the church. Inez was a wonderful lady. Worked with her at the State Auditors Office years ago. You will be missed lady. I worked with Inez at the Montana State Auditor’s Office in the mid 70’s. She was a great gal, a good worker, proficient and productive. She also had a great, subtle, sense of humor; she was fun to be around. My condolences to her family. Rest in eternal peace Inez. Mom, thanks for everything. You gave it your all. We love you, Rest in Peace, great lady. God bless the Hohn family. Your mother and grandmother left you a great heritage. What a special woman, though I never met her, I know one of the sons she raised and got to see her in him! May your memories be great, and may the grace an peace of God be great in your all! Her. She was indeed a special lady and my mom Dorothy Colby always loved her. Dear family, I will miss waking up to Inez’s loving and uplifting Facebook posts each morning. Aunt Virg and my dad, Melvin O’Neal, shared the same wonderful memories Inez did about her time living with them in Des Moines, IA. Remembering Inez’s love & light as she sits with her Heavenly Father and those she loves in Heaven. Until we meet again. Valerie O’Neal and the Kucker/O’Neal family. This family would not be what it is today hadn’t it been for you and Grandpa. Thank you for being such an extraordinary person. We’ll take it from here. Love you. Heaven has received a new saint. Blessings to all the Hohn family. Our prayers go with you all as you grieve your loss. So enjoyed getting to know her when we served TUMC. Our love to you. What a blessing and inspiration Aunt Inez was in our lives! We so enjoyed our visits with her at Hohn Fest in recent years. Our sympathy to all of the family. Blessed be our memories of her and peace to all who loved her. What a great lady she was! It was an honor knowing her. Thank you for that honor. When I first met you at the Mother’s Day Tea at Holy Cross I knew you were such a special spirit! Your stories and laughter never left my soul. My parents enjoyed your company and so did I. Your legacy lives on by your wonderful family and friends. You touched many of us and we are truly blessed from God that he allowed us to be filled with your love Inez. I am thankful for all the souls you have impacted! God bless you and your family! Aunt Inez thanks for all the memories you always shared with us and keeping all us kids on the right path. I will miss your honesty when speaking to us. You never sugar coated anything. Your kindness and energy will be missed. You always shined the brightest in any room or gathering. What a great legacy she has left! Praying for God’s blessings and comfort for the whole Hohn family. Brian, I am so sorry to hear about your mother. Prayers to you and your family. Jim,Tom and family- I was so sorry to hear of your mom’s passing. She was a gentle woman, may she rest in peace. To the Family of Inez: I went to the same church as Inez and lived down the street from her for several years (in East Helena). I loved her fun-loving brashiness and how meticulous she kept her home and beautiful garden. I have thought about her quite often and will continue to do so and she looks so pretty in her picture. Blessings to all of you. Condolences to the Hohn family. Inez kept things interesting wherever she was. She was a big hearted lady and will be missed. It was such a blessing having the Hohn kids all through my life. I didn’t know Inez well but remember seeing her and always admired her balancing the activities of life with all those boys! My mom used to comment on how beautiful the sweater/coats she made for her kids when they were in elementary school. It is such a comfort knowing those we love are with Jesus. What a wonderful picture of your mom being with Bob again. Blessings and prayers for your family. I send my condolences to Sheila, Jim and all the family. Mrs. Hohn was a favorite mom to us as teens. I am so happy to have visited with her again in the past couple years. One indicator of what an awesome lady she was is found in her chikdren…just great people. One thing I add to the many nice things said of Mrs. Hohn is that when we were high school students in the early 60s, Mrs. Hohn always encouraged us to be good students and praused our successes. She monitored the quality of our school in a positive way. She was admired by our teachers and loved by us teens. My wife, May, who had the pleasure of meeting Mrs. Hohn told me to add “What a very nice photo” of your mom. Wishes to Sheila especially, and to all the children, as you pass through this part of life’s journey.